From a Mark Begich press release: A new Rasmussen Reports poll shows Democrat U.S. Senate Candidate Mark Begich leading Republican Sen. Ted Stevens by two points. The poll, conducted May 14, shows Begich with 47 percent of the vote to Stevens' 45 percent. The margin of error is 4.5 percent. 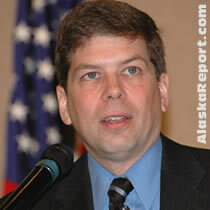 A month ago a Rasmussen Reports poll showed Begich at 45 percent and Stevens at 46 percent. The latest Rasmussen Reports telephone survey finds that Republican Senator Ted Stevens is trailing by two percentage points in his bid for re-election. Stevens attracts 45% of the vote while Anchorage Mayor Mark Begich (D) earns 47%. A month ago, it was Stevens with 46% support and Begich at 45%. Any incumbent who polls below 50% is considered potentially vulnerable, especially when they trail a challenger early in the campaign season. Stevens is supported by just 68% of those who plan to vote for John McCain. Twenty-four percent (24%) of McCain voters say they'll be splitting the ticket to vote for Begich. Six years ago, Stevens won re-election with 78% of the vote. Since then, however, he has been caught up in a federal corruption investigation. FBI agents served a search warrant on Stevens' Girdwood home. Two years ago, the state's Junior Senator Lisa Murkowski narrowly held on to her seat and won with less than 50% of the vote.